The best Whole30 curry meatballs are the perfect addition to your Whole30 weekly meal plan. They taste wonderful reheated… or cold! Bring them with you to lunch atop a big and hearty salad or enjoy them with a big bowl of cauliflower rice for dinner. Just wanted to let you know these incredible oat bars are sponsored by my friends at KitchenAid! You should add Whole30 curry meatballs into the rotation. I’m really clueless as to why it has taken me so long to come up with a recipe like this. I’m a curry fiend… ask anyone. I love Thai curry, Indian curry, you name it. However, once I discovered how easy it was to make curry at home, there was no turning back. I love picking up curry paste at the local grocery store and getting down with the stove. Seriously, once you pick some curry paste up, you’ll understand why it is such a game changer. These Whole30 curry meatballs were finished by my husband in TWO days… I got to eat… 3 meatballs- total. These Whole30 meatballs are loaded up with all of the good stuff! I’m so excited to be teaming up with KitchenAid for these meatballs. I was able to get my hands on their gorgeous 9-cup food processor, and it truly brought this recipe over the top. I loved that I was able to just throw all of my meatball ingredients into the food processor and give it a whirl. It’s so convenient to have and it looks really beautiful on my countertop. Whole30 curry meatballs fit for royalty! I have a few theories as to why these meatballs are so good. They are loaded up with all kinds of fresh herbs and vegetables… nothing boring or nutrient deficient here! The curry sauce they are swimming in is to die for! A little fish sauce adds so much umami… and goes a long way! I really wanted to come up with a recipe for a protein that could be served cold on top of some sort of salad but also warm with some veggies or cauliflower rice. After trying these Whole30 curry meatballs cold, I can assure you they stand up to the test. Usually, my hubby is too lazy to heat up leftovers. However, in this case, he really had the right idea. I tried a ball cold and was completely sold on it. Imagine how incredibly easy it would be to throw these onto a large bed of greens with some extra veggies, pour some curry sauce on top and chow down on your break at work. No microwave necessary! I’m patting myself on the back as I type this… for real. 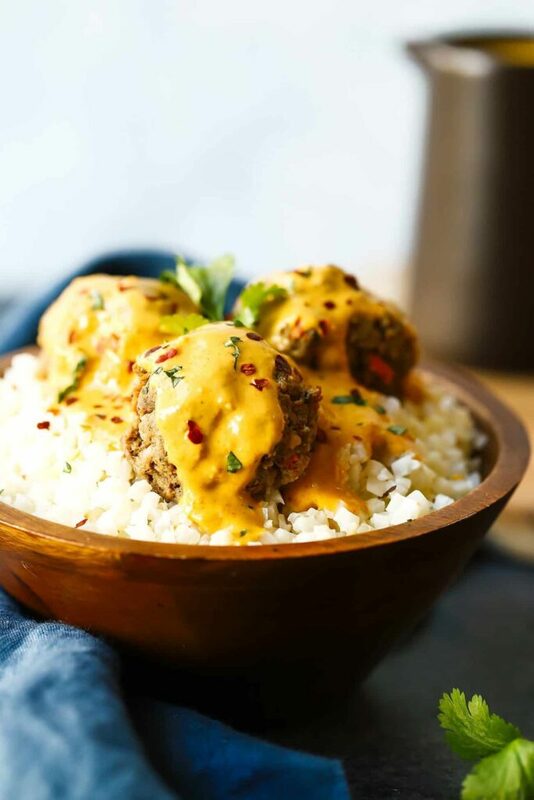 Get on board with these Whole30 curry meatballs, and you’ll be thanking me very soon. Promise. This post is sponsored by the lovely folks at KitchenAid. Thank you for allowing me to continue creating such incredible content by supporting relationships with incredible brands and companies that The Movement Menu enjoys working with! Opinions will always remain 100% my own! 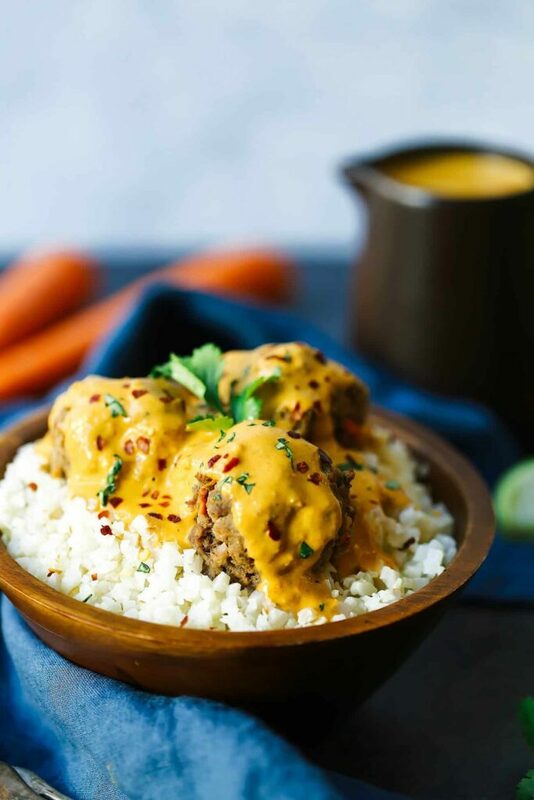 These Best Ever Whole30 Curry Meatballs are the perfect addition to your Whole30 weekly meal plan. They taste wonderful reheated... or cold! Bring them with you to lunch atop a big and hearty salad or enjoy them with a big bowl of cauliflower rice for dinner. Any way you want them- they're amazing! This recipe can be made and served on top of a bed of rice as well. Stick with cauliflower rice if you want to keep it Whole30 compliant! Preheat the oven to 375 degrees Fahrenheit and adjust the oven rack to the middle position. Line a baking sheet with parchment paper and set aside. 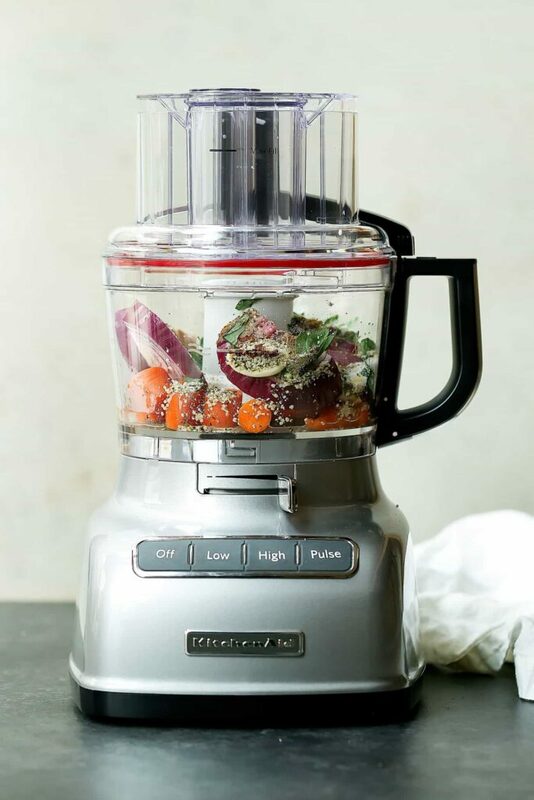 Place all of the ingredients (except the beef) for the meatballs in the bowl of a food processor. Pulse for 30 seconds or so until mixed well. Do not over process, as it will become mushy! Add the meat and process a few more times. Roll into 1 1/2 - 2" balls and place them on the prepared baking sheet. Bake for 20 minutes and rotate the pan 180 degrees. Bake for another 10-15 until they have reached your desired doneness. I like mine cooked to a medium doneness, so I pulled them out after 30 minutes. While they finish cooking, prepare the curry sauce. 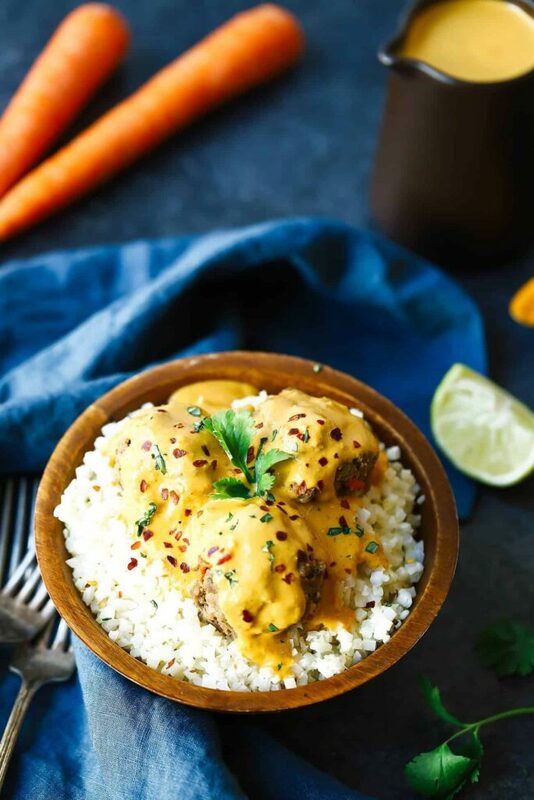 Serve the meatballs on a bed of cauliflower rice or regular rice (if you aren't Whole30ing!) Cover with the curry sauce and garnish with fresh herbs and red pepper flakes. These look incredible! I have a few friends on Whole30 who would love this. 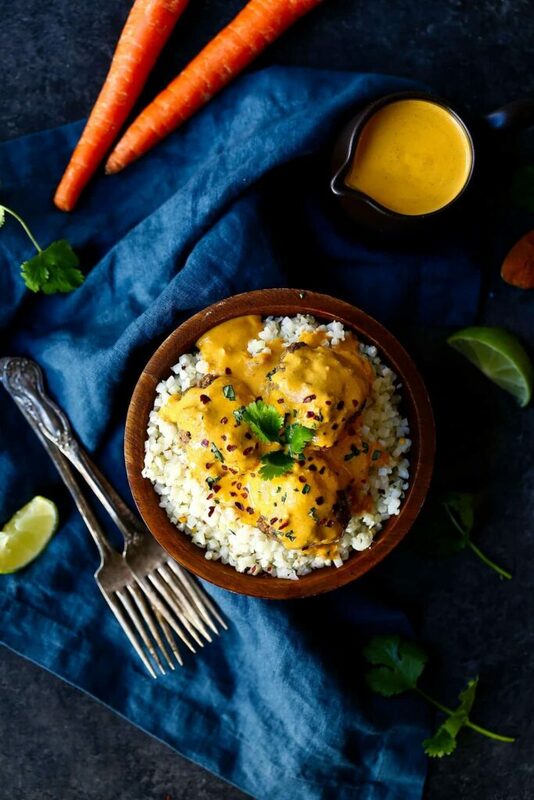 I’m a curry fiend as well – This dish looks super tasty! Is a serving size 1 meatball? Would almond butter work ok in place of cashew??? These are so amazing! We have actually made them a few too many times and they never fail. My husband is always a little nervous about anything too clean 🙂 and he LOVES these, we even made extra sauce, so we could pour it on anything and everything! This is in our regular rotation! Can you do me a huge favor and give the recipe a rating (1-5 stars)? You can do so towards the bottom of the recipe post. That helps me out a ton! Sounds yummy but the Thai curry paste linked is not Whole 30 compliant (Soy), do you happen to know one that is? Hi there, the red curry paste by Thai Kitchen doesn’t seem to have any soy in it… can you link me? Thanks I found that the one in the small jar does not have soy but the Amazon link takes you to one that’s in a larger tub and it does have soy. Both the same brand Thai Kitchen. I bought the right one! Can I make these with ground turkey instead? Would you change any of the other ingredients with this substitution? Thanks! Hi there. You can absolutely do that. I may add in some bacon, as turkey is much drier! DO you put the cauliflower rice in the meatballs themselvesor is that on the ingredient list for putting the meatballs on top of to serve? Dish looks amazing! My boys are allergic to nuts…is there anything that I can substitute for the cashew butter in the curry sauce? Thank you! Can you use sunflower seed butter? I’ve found that I’m not a fan of riced cauliflower in place of rice….but let me tell you what goes AMAZING WITH THIS! Riced plantain! I used some coconut oil, minced garlic, riced plantain, and when it was finally crispy enough I dropped some lime juice and salt into it and let it sizzle for a second. 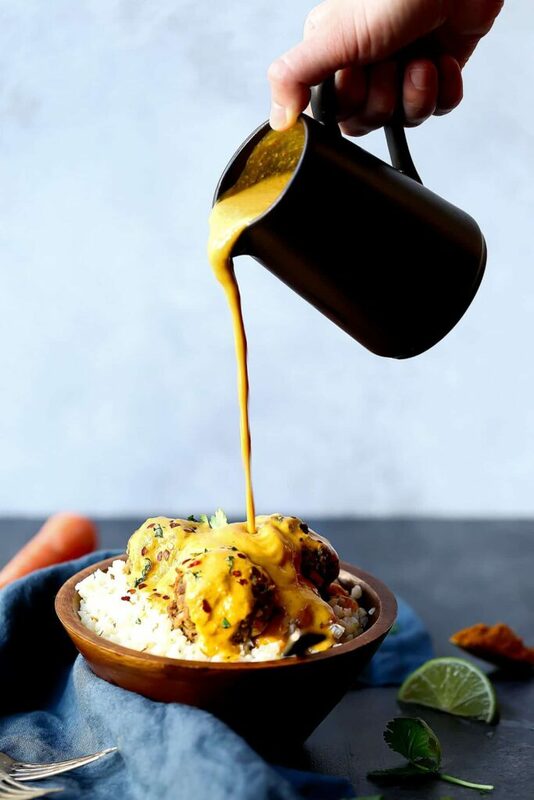 This curry sauce over the riced plantain is dangerously good. First time I made these I fudged the recipe a little because I was missing some of the ingredients. But they were still so good. Second time I made it to the T. It is one of my favorite recipes I have ever found online. Thank you for sharing it! This makes me so unbelievably happy to hear!! I’m so happy you enjoyed them. These were insanely good! By far one of the best whole30 meals we have tried!! This makes me so, so happy to hear. Feel free to rate the recipe using the star system on the recipe card if you’d like! It helps me and my readers out tremendously. Are you doing a Whole30 now?